A new season means there are so many pretty spring clothing pieces in the shops right now that I am finding myself lusting after! And in true Jennie form, there are always lots of pretty make up items I would love to add to my make up collection. As if I don't have enough already, I need to remember that I only have one face! I have loved the oversized cricket cardigans and jumpers for ages and this cosy looking cricket cardigan from LOVE clothing would make the perfect addition to my wardrobe! I can just see this looking super cute over the top of sweet summer dresses in the cooler evenings during summer. Not everyone's taste I'm sure but I simply adore it! The Shimmer Brick's from Bobbi Brown are definitely a luxurious purchase at a whopping £30.50 each but my gosh, they are so beautiful! I hadn't seen one in person until super recently and I just fell head over heels in love with the Rose shade. These shimmery beauties have had countless amazing reviews and I just know I wouldn't be disappointed if I were to invest in one! One day! This adorable little mouse bag from ASOS is possibly the sweetest bag I have ever seen and I simply must add it to my spring wardrobe! It's little whiskers are so cute & the grey colour would look beautiful against pretty pastel hues! This stunning aqua lurex twist back dress from LOVE clothing is such a bargain with the 50% off code and I would order it in a heartbeat if I didn't think the the main skirt would be too short on me. It looks amazing on the model and girls online but they all have such lovely toned legs, I don't think it would be flattering on my shape at all but I still absolutely adore it! The aqua colour is one of my favourites for the spring and summer. Sticking on the pretty pastel theme, these patent slipper shoes from New Look have really caught my eye. The lilac colour is so pretty and the little tassel on the front is that little added detail that makes the shoe extra cute! I think the lemon yellow color these come in as well is super lovely, they're so affordable too which makes them even better! Now it's no secret that I'm not a huge eyeshadow wearer but NARS is fast becoming my favourite make up brand and I feel the overwhelming need to try one of each product they make which is ridiculous and definitely not very good for my bank balance! The two eyeshadow duo's I have my eye on in particular are Isolde which has warm orange toned brown shades and Kuala Lumpur which has rose gold and pretty purpleish shades. Real Techniques brushes have been taking the blogging and YouTube worlds by storm and I am lusting after them big time! The two brushes I'm particularly interested in getting are the Buffing Brush and the Deluxe Crease Brush, both of which don't seem to be available individually which is a shame. The Core Collection & the Starter Set are both super reasonably priced and they seem to contain a good range of brushes. I think I might put these on my birthday wish list! What's on your wishlist at the moment? 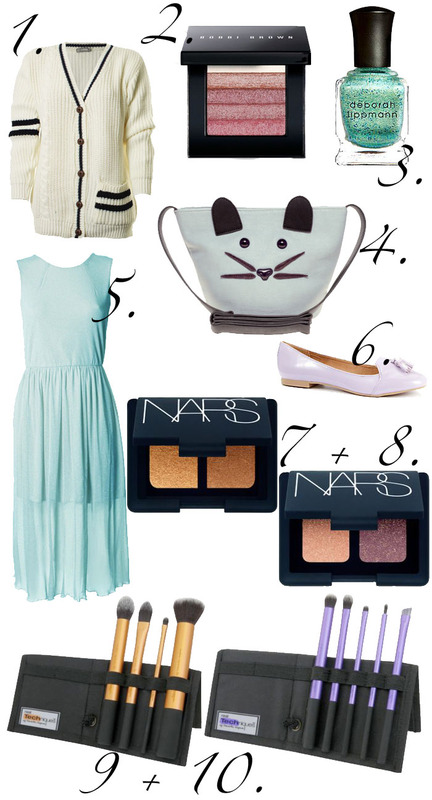 Have you found any super cute spring time clothes or accessories recently? P.S. I'm currently in the process of setting up a little print shop for my photographs and I would really appreciate if you could take a couple of minutes to fill out this little survey for me! Thank you! That mouse bag is just too adorable!!! I have 3, 9 and 10 on my list too! Deborah Lippmann polishes are amaze. I feel like my life would be complete if I owned them all...I have also bought number 1...! Love love love it. So perf with pale demin aka my spring staple. Totally love this Deborah Lippmann shade! £16 is a lot, but the quality is really good! Ahh my wishlist just gets longer and longer!! In love with that cardi and DL nailpolish. Very summery! :-) you have Fab taste hunny. Love the nars eyeshadows, definitely want to add a few to my beauty bag! *GASP* I saw that polish a day or two ago. Up until then I though Deborah Lippmann must be off her banana hammock if she thought I was shelling out £16 for a nail polish but this one I just HAVE to have. I would love a big long row of them in my wall rack thingy as they're such a pretty bottles and glitter makes me happy but I also like having food in the fridge... decisions decisions. I've tried a few Real Techniques brushes - mainly the pink ones actually but I can't recommend them highly enough :) They clean really easily too which a lot of people don't mention. love the dress too, but can see why the bottom skirt may be a little short for me too! I've been after a cricket jumper ever since Diana Vickers burst on to our scenes! Kind of forgot about it but I'll have to get looking again! Those pastel slippers are too cute!